When I was working on my play DARK MARKET I blogged about a mathematician slash stock trader named Iris Mack. I was prepared to admire her but then I discovered her Facebook profile and her bizarre, incoherent political views, which included far-right and anti-vaccination conspiracy theories. I wrote about her almost four years ago and haven't thought too much about her since then. Oh no.. an intelligent free thinking black woman who confuses you into butthurtism.. this typical reaction to individuals that dont fit in neat boxes exposes the complete hypocrisy and idiotic ideology of the left. Cheers! That was odd and apropos of nothing. So I Googled around to see what ole Iris Mack was getting up to. 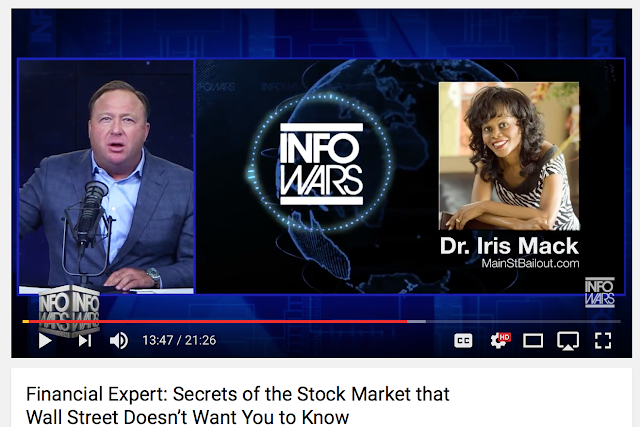 Apparently Iris Mack is hanging out with the extremist most nutty alt-right freak of them all, Alex Jones. Alex Jones, in case you don't know, is the king of fake news, the purveyor of reckless, insane, dangerous rumor-mongering, one step below even Breitbart. The kind of nuttiness that the Trump presidency has normalized. Jones, perhaps realizing he could become the target of a lawsuit with his reckless disregard for reality, took down his "pizza gate" content, but not before a lot more people realized what a monster he is as well as his connection to Donald Trump. Selling out your credibility to a monster like Alex Jones - oh how low you have sunk, Iris Mack.